B is for Batarang, so here's today's entry in the A to Z blogging challenge. The Batarang is one of the most enduring weapons in Batman's arsenal. That's why I thought it would be interesting to take a closer look at this simple but powerful tool in Batman's war on crime. Here are eight interesting and possibly surprising facts about the Batarang. 1. 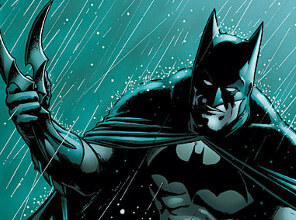 The First Batarangs Came Late - Though batarangs are Batman's most iconic and memorable weapon, Batman never used batarangs until Detective Comics 31, five issues after his first appearance. They were originally spelled "baterang." 2. The Father of the Batarang - The batarang was not conceived by Bill Bob Kane, the creator of Batman, but by his writing partner, Bill Finger. 3. The Batarang is Supposed to be a Boomerang - Seems obvious. The name "batarang" is a fusion of "bat" and "boomerang." In the earlier versions, that's really what it was. However, consider the fact that the batarang's more recent incarnations have not actually been boomerangs. If you look at the weapon in Batman Begins, it's more like a sharp metal throwing knife or shuriken. Batarangs have evolved into a very multi-purpose weapon for the Dark Knight. They're explosives, homing devices, buzzsaws, knives, tasers, and grappling hooks. 4. Batarangs Have Us Hooked - Batman always used a simple rope and batarang to climb to high places until the 1980's when artist Norm Breyfogle introduced Batman's grapple gun. The grapple gun has become one of his most popular modifications for the batarang. 5. No Batarangs in Dark Knight - Even though the batarang was used in promotional posters for The Dark Knight, Batman never actually used batarangs in that film. The only time we see them is when Bruce Wayne was putting away his weapons, seemingly for good. 6. No One Calls Them Batarangs - When was the last time you heard Batman say, "Hand me my batarang" or "where's my batarang?" Usually, he just pulls them out and we know what they are. Yet Batman often refers to his Batmobile as the Batmobile. The reason Batman rarely refers to his batarangs by name is partly that they're so ubiquitous that we all know what they are. Also, it's a conscious attempt for writers to distance themselves from the sixties version of Batman, which gave Batman too many corny bat-named gadgets. 7. The Movie Batarangs - If you look closely in the movies, the batarangs are always shaped to match the specific Batman logo used in the film and marketing. 8. The Batarangs Are Non-Lethal - Another reason that the batarangs are so popular with Batman is that they are non-lethal weapon, tied to Batman's no-kill policy. Even at their most basic, they can be used to disarm an opponent, tie them up, or distract an enemy without causing permanent injury or death. What do you think of the batarang? Any other interesting facts about the batarangs you can share? This post is part of the month long "A-Z Challenge." For the next 27 days, we'll be choosing a letter from the alphabet and crafting a post around it. To read more of the posts in the series click here azchallenge2012. To find out more about the challenge go here. That is pretty interesting actually, although I'm not that much of a Batman fan this can come in handy someday in some conversation. Who knows! I had no idea that the 'batarang' was called a 'batarang'! I don't know what I thought they were called, I guess in my mind they are just another weapon - along the lines of ninja stars! Another nice, well-researched post out here Nigel! Didn't Batman shoot Batarang-shurikens out of his glove in TDK? No, those were detachable spikes on his arm guard. Morgan Freeman's character added them to his new costume- Bruce fired them earlier before being instructed to. Was the first use of the batarangs as a bladed, skin-piercing weapon (as opposed to a bonking kind of weapon) in Frank Miller's "The Dark Knight Returns"? The creator of Batman was not "Bill Kane". It was Bob Kane. That's a good question. I wasn't able to find out when the change occurred. Well, in Batman Year One, which was also written by Frank Miller, Batman uses these "mini- batarangs" like ninja stars that is sharp enough to hurt someone and stick on them. I tried but I can't recall a Batman movie other than Batman Begins that designed the shape of the batarang matching the movie logo. Might not have noticed it, but there are differences if you watch for them. If you go to the Batman wiki, they have a gallery of all the different movie batarangs. Loved the sly wink to Bill Finger, Mo. He's the true creator of Batman.